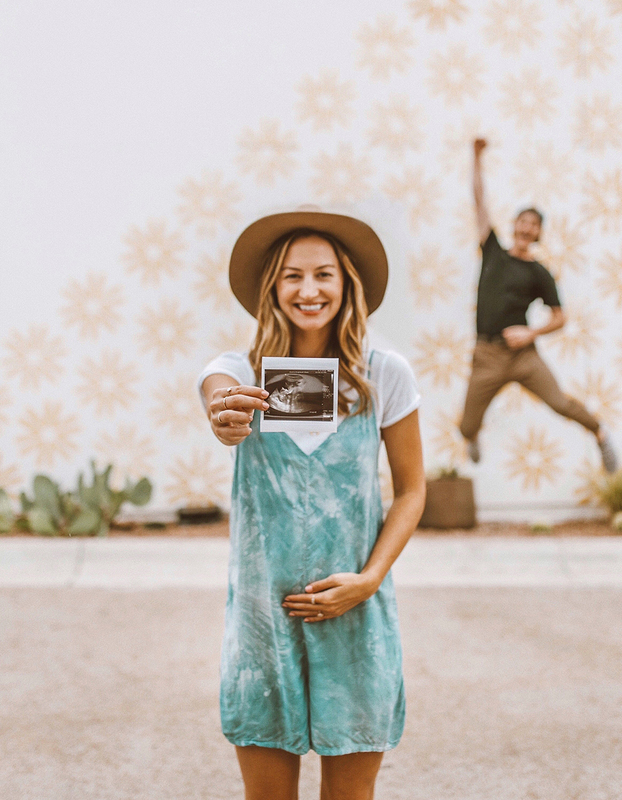 In early June, I had noticed my stomach was feeling a little funky – sort of a mix of bloating and cramping…so I was fully expecting to start my period as normal. I was hanging out with my sister, Kimberlee, and was hunched over holding my stomach when she asked if something was wrong. I didn’t even notice I’d been standing that way! I told her how I was feeling and that I should be starting my period sometime that week, but she recommended I take a pregnancy test just in case. So! I went home, peed on that fateful stick and sure enough, before I could even set it on the countertop, it read “PREGNANT” within seconds. I immediately started bawling (…tears of shock…more like “but wait, I had planned to travel to this country and do this work project and OMG I have to give up wine…!” haha ah! Woah is me, right?) and grabbed my phone to call my sister and tell her the news. I was sobbing so hard I couldn’t breathe and she asked, “OLIVIA DID WATSON DIE? !” Haha! I was in such shock that she thought something happened to Watson! After a few deep breaths, I was finally able to tell her the test read positive and she was extremely comforting (she’s a mom to two perfect angels) and told me it will all fall in to place – it’s meant to be, the timing is perfect and this little bundle will be the best thing to ever happen to us. Instantly, I was so excited about what our future had in store. The thought of a little human that’s 50% Blake, 50% me is SO CRAZY and absolutely incredible. It’ll be amazing to watch Blake be a dad (gah, I get teary eyed just thinking about that one! ), and becoming a mom is something I have always wanted. We’re ready for our whole world to change in February 2019! 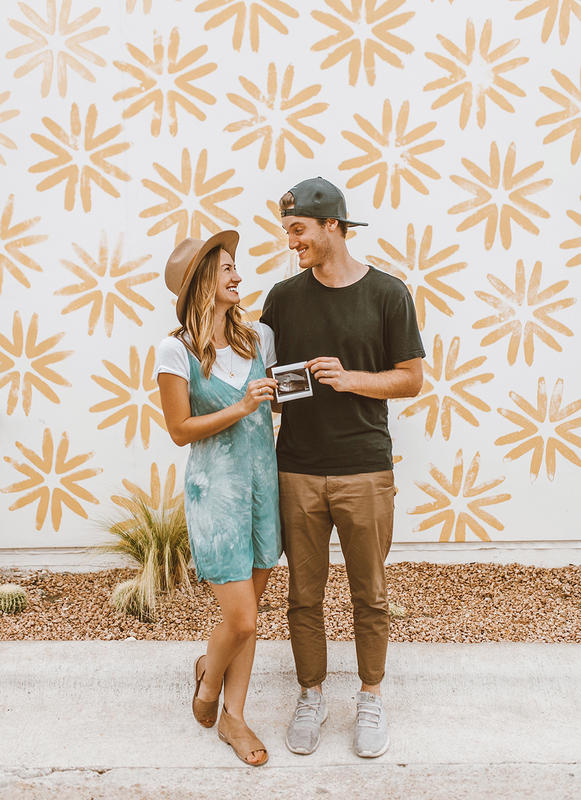 I found out on a Friday (it was actually two days before Father’s Day, funny enough), and so after talking to Kimberlee, I went and bought another pregnancy test pack (…all positive, three for three) – then started thinking about how I wanted to tell Blake. (This was the fun part haha, now that the shock had been replaced with giddy joy!). Blake always wears the same Adidas sneakers (he has them in all the colors haha, not even joking! ), so I went and got the baby version of those (omg baby shoes…holy crap are they SO CUTE) and picked up a funny Father’s Day card. I wrote a bunch of sappy stuff in the card, then placed one of the pregnancy tests inside the envelope before sealing. When he got home from work I was sitting on our bed and asked him to come and talk with me. At first he didn’t suspect anything and we just chatted about our day as normal (my poker face must have been really good haha! )…then I said I had a surprise for him and handed him the card first, then the shoes. He didn’t even pull out the full card before he saw the front said something about Father’s Day and he immediately dropped it on the bed and pure shock fell across his face, he kept saying, “Are you serious? Wait, are you serious? !” haha!! Then we both started crying and hugging and it was so wonderful and crazy and ah, quite an emotional, happy moment. Ohh it feels so good to finally share this giant secret with y’all!! It’s been really fun and sweet to relish in this special time with close friends, family and Blake, but I have been so thrilled that THIS was the week I was sharing it with you guys! Truth be told, I barely slept last night knowing I was going to write this post today…I love what I get to do everyday and I love sharing bits and pieces of our life with you guys and hearing about yours and how we all relate. It keeps me motivated and excited to do what I do each day! So – a big thank you for stopping by to read this post, it means more than you know. Lastly, I wanted to share our full story because my blog is a space where I can share personal thoughts and chronicle big moments like this one. I fully understand that people become parents in a myriad of ways and there is no right way – planned, unplanned, adoption, In Vitro – you name it, they are all beautiful and special! Congratulations! My husband and I are 13 weeks pregnant with our first so your story is so similiar as I found out a few days later than you in June! Excited for your future posts! Congratulations! I can’t wait to see how this journey unfolds for you! This is so exciting! Congratulations!!! I’m 12 weeks now, so excited to follow along with you (and get maternity style ideas)! Huge congrats! What an exciting time :] I am just imagining Uncle Ben and Aunt Elissa teaching your sweet kiddo the special fun walk/dance thing they do!!!! So exciting!! Congrats to you both! Congrats!! I’ll be 14 weeks along tomorrow so it’s exciting to hear about your story! Love following you and eager to read more and see more pictures throughout your journey!! I’m 12 weeks along and announced to my husband on father’s day! It’ll be fun to follow along and hear your ideas! Omg I totally knew it!! I saw your baby pins and noticed the loose clothes. 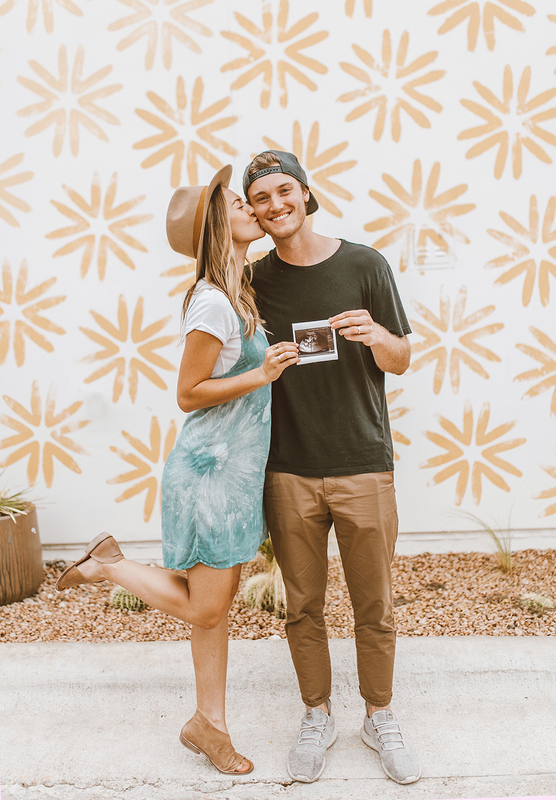 I am so thrilled for you guys and literally cannot wait for the maternity fashion pics! Also an aside: thank you for mentioning ivf! My husband and I will be starting our first round this fall due to the possibility of passing on a genetic condition, and it’s so nice to hear such influential people mention it and be accepting. Congratulations!! Ah I love this story- the little shoes!! Congratulations! My husband and I were trying to conceive and even when I saw the positive pregnancy test there were all kinds of emotions! I also called my mom and she calmed me down. She said, “Chels, you’re so worried and scared because you care a lot!, and that’s a good thing. You’re going to be.a great mother” I was so mixed with emotions but that hit home for me and rest me assured that I was ready for this! I’m 16 weeks pregnant and am excited to see what you come up with to wear because I’m struggling! All i wear is high waisted jeans and well, those obviously aren’t going to fit anymore 😂. Congrats and enjoy the journey! Congratulations!!! I was wondering when I saw your Pinterest board all about babies 😉 Can’t wait to see your maternity and new mom style. Can I share something my midwife told me at our 6 week postnatal appointment? I was asking her when my body was going to “go back” to the way it was before pregnancy and she said, “probably never. Everything is different now. You and your husband are different people now that you’re parents. Why would you want to go back?” That one little comment has helped me love my body more than I ever have. Aw, I love that so much – thank you for sharing!!! My body has already changed quite a bit and it’s been a mental challenge to accept and embrace it! Working on that everyday… especially given my field of work where I am so frequently editing tiny details in photos of myself…ah! 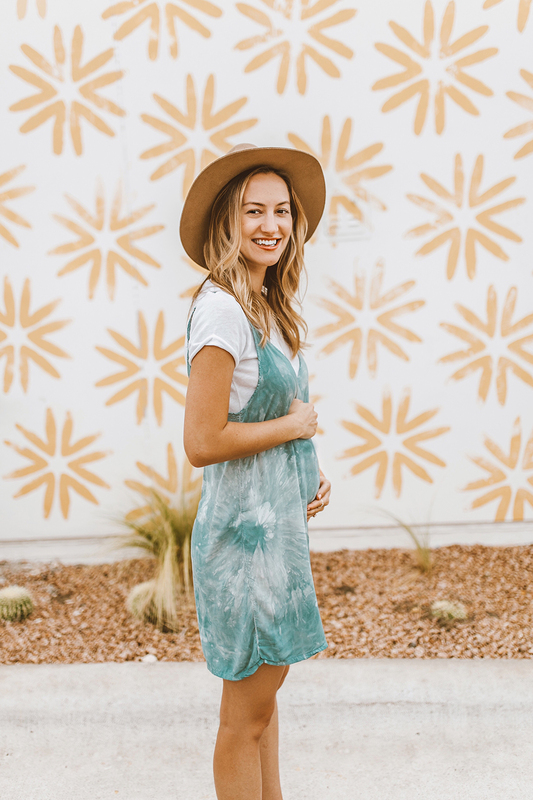 Very blessed and grateful to be able to grow a human – it’s so incredible…and that’s what gets me through watching all these changes take place (growing thighs, a little softer around my midsection, cravings I just can’t ignore…ohh pregnancy, I had no idea what it is truly like haha!). I’ll have to share that quote with my husband, it’s beautiful! Thanks for the kind words & for stopping by, xoxo. Congrats! Where is your romper from?